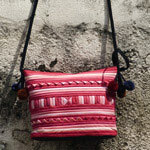 A lovely cotton shoulder bag handmade by artisan Issaraporn Saeyang. 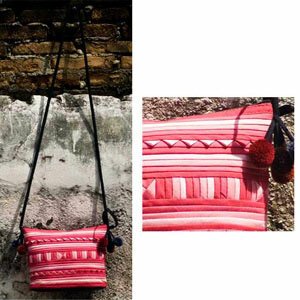 The exterior features multicolored stripes appliquéd in the Lisu fashion and pompoms. 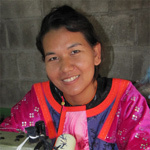 Issaraporn lines the interior with polyester and closes the bag with a zipper.